Searching for the prettiest palaces & castles in Southern Germany? You poor thing- have you got brain-ache yet? I jest… sort of. When we planned our trip to Germany, we knew that there would be castles. Heck, one of the reasons we I wanted to go to Germany was to visit Neuschwanstein- the most amazing fairytale castle of them all. But I didn't expect the others to be so…well… wow. I didn't expect the sheer awe as we rounded a corner and saw yet another incredible castle perched on a cliff. Seriously, how the heck do they stay up there?? Or the splendour & opulence of the many beautiful and jaw-dropping palaces. And I didn't expect there to be so MANY!! When we were researching, it sometimes felt a little overwhelming. (I know it's not always obvious, but we DO research. Sometimes.) There were so many beautiful places (over 20,000 in all- check out some of the most Instagrammed castles in Germany) and we only had 14 days- how were we ever supposed to choose which ones to visit? And how did I balance my family's demands (which mostly involved Bratwurst) with seeing as many fairytale castles & palaces as possible? If this sounds at all familiar, don't panic. Here's our guide to 16 of the best, most amazing fairytale palaces & castles in Southern Germany so you can decide which ones are right for you. I've tried to list them from East to West to help you plan your route. I've even added in how accessible they are by RV/ motorhome- because that's a pretty important consideration when you're planning a road trip. But don't worry if you're not travelling in a van- there are plenty of options for you too. READ THE FULL REVIEW OF OUR VISIT TO HOHENZOLLERN CASTLE HERE- complete with video!!! Hitler's Eagle's Nest (Kehlsteinhaus). Not really a castle- but what a view! Did you know that Burg means Castle and Schloss means Palace? Yet often, the two words don't tell you accurately what you're getting. For example, Schloss Drachenburg looks as ‘castle' as they come! (Turns out, it's actually a villa…!) But the phrases might come in handy in a pub quiz sometime… 🙂 Ok, ready? Pull up a drink (or two) and let's get started with the prettiest, most fairytale-ist (what, it's a word), just downright best palaces & castles in Southern Germany. Fairytale castles can't get much prettier than this! Why is it on the list of Best castles in Southern Germany? This castle is something straight out of a storybook. It's nestled in a valley, which is unusual for a castle. The only way to get inside is with a guided tour, but in summer it is possible to visit the castle by BOAT, which frankly doubles its cool factor. For more info on the boat tour, which lands about a 90-minute walk or a short taxi ride away, visit HERE. EASE of PARKING with RV: Good. Parking is 4€/ day. You can't drive up to castle but there is a shuttle bus. TOP TIP: Get there about two hours before opening time in order to get amazing photos without any people there. How's this for a fairytale castle in Southern Germany? Why is it on the list of Best castles in Southern Germany? Talking of visiting castles by boats- how's this for impressive!?!? This is Cochem Castle, situated high on the hill above the Moselle river. As with most of the castles in Germany, you can only go inside as part of a guided tour. There are a couple of tours in English each day, currently they are at 12pm and 3pm, but check in advance. Alternatively, english speakers are given a leaflet to help as you walk around. TOURIST NUMBERS: Not crazy, but can get busy on a weekend. If you can, visit mid-week to avoid the crowds. EASE of PARKING with RV: NOT GOOD. There is no special parking, you need to park in the city of Cochem and then walk 20-30 minutes to the castle. There doesn't seem to be a lot of accessible parking for RV's in Cochem, so proceed with caution and be prepared to park outside the city if you find somewhere more suitable. SECOND TOP TIP: You can go to a medieval evening banquet at this castle! Oh yes. Prices cost 49€ and MUST be booked in advance. Check out more info HERE. Opening hours: 9-5pm but please check in advance. Banquets are on certain dates in the evenings. One of the most haunted castles in Southern Germany? Why is it on the list of Best castles in Southern Germany? Oh, if these walls could talk! We visited this castle on Friday 13th, which seemed appropriate. It was also dark and drizzly- which really added to the atmosphere! This castle was home to scientist Konrad Dippel who used to use animal and human body parts in his experiments! Apparently, there is a huge Halloween Festival here each year- which sounds like a lot of fun. The castle is ruined, but there are plenty of walls and stairs left for kids (and adults!) to run around on. It's obviously used for some stage/ theatre productions as well- there were all sorts of things kept in various rooms! The entrance fee was a donation box as you walked in- we left a couple of euros each which was the suggested donation. We didn't actually see a soul around except for us- even the restaurant was closed. It's unlikely Mary Shelley ever visited the castle, although she did apparently pass close by 4 years before her novel was released. In fact, there is no reference to ANY castle in her novel at all. The castle element to the story was added by the first movie, created in 1931 and ever since Frankenstein (who is the scientist, NOT the creature) has been linked to castles. Having said that… there was a mad scientist who did experiments with animal and human parts, who lived in a castle called Frankenstein. Coincidence? I'll let you decide! WOW FACTOR: 2/5. It was better than we expected, and it was nice to have it entirely to ourselves, but if you're short on time this isn't one of the best. TOURIST NUMBERS: Very little in April. I expect it to be busier in summer, but it's a nice place to bring a picnic. Halloween is busy! EASE of PARKING with RV: There is a parking lot and also bus parking, but space may be limited in summer and there's a shuttle bus put in place for Halloween from a Park & Ride at bottom of the hill. Opening hours: 11am-10pm, but please check in advance. Best fairytale ruins in Southern Germany? Why is it on the list of Best castles in Southern Germany? Apart from the impressive view over the valley, Schloss Heidelberg is both very pretty & huge. Seriously, plan on a few hours for your visit. The stonework is a beautiful & unusual colour and wandering the ruins is the closest to time travel we will probably ever get. It's got a great atmosphere. Also, the town of Heidelberg is GORGEOUS and well worth a visit so if you can, plan to spend a night or two in the area. You won't regret it. WOW FACTOR: 4/5. Ruined, but impressive- even in the rain. TOURIST NUMBERS: Pretty high. Try to avoid summer weekends if possible and arrive early to avoid the tour buses. EASE of PARKING with RV: Nope. If there is a dedicated car park, we couldn't find it. We ended up getting stuck in some TINY roads in our motorhome. The streets were so tiny they were cobbled. To make it worse we went around the loop twice and got stuck. Twice. If anyone knows anywhere good for motorhomes to park- let me know! Ticket price: 7€, which includes use of the Funiculur railway. Guided tours 5€ extra. Why is it on the list of Best castles in Southern Germany? For years, this has been the start of the ‘Romantic Road' across Southern Germany- and what a place to start! The gardens are beautiful and have been preserved to look almost the same as they did 300 years ago. More than 40 rooms are open to the public and can be viewed as part of a guided tour. The residence is very well adapted for people with extra mobility requirements, with ramps and disabled parking right outside. There are tours in English every day at 11am and 3pm, with some extra ones in summer. TOURIST NUMBERS: Very busy in summer. Arrive early or late if possible. EASE of PARKING with RV: There is a ‘Parkplatz Residenz' car park which can accommodate coaches and motorhomes. Parking is chargeable. Tickets: 7.50€/ adult- entrance to gardens are free. Children are free. Not bad for a summer house!! Why is it on the list of Best castles in Southern Germany? Oh my word- would you look at that! How has such an incredible building survived the drama of the past 300 years?!? Guided tours run regularly, with at least two each day in English. The tours are much longer than most others, at around 90 minutes and they reveal the secret life of the Royal family ‘behind closed doors'. TOURIST NUMBERS: Pretty crazy in summer. EASE of PARKING with RV: Unsure. Apparently, it's pay and display parking and a short walk to the Palace, but it's not clear whether the parking is street parking or suitable for motorhomes. If anyone can shed some light on this, please let me know. Ticket price: 7€, with an extra 2€ for entrance to the museum, where kids are encouraged to touch things… good luck explaining that to them at the next museum! Is this the best fairytale castle in Southern Germany?? Or indeed the whole of Germany?!?! Is this the best fairytale castle in Southern Germany?? Why is it on the list of Best castles in Southern Germany? Apparently, this is a villa. A VILLA! Do you think you could rent it by the week?? There is a rack railway (the same as the one going up Zugspitze) called the Drachenfels railway. Here's the link. The castle (villa!) also has a light show (Schlossleuten) which runs every weekend from mid-February- mid-March- the castle is lit up in beautiful colours and looks very impressive. TOURIST NUMBERS: As you would expect, it's busy in summer. EASE of PARKING with RV: Public parking with a 10-minute walk to the Schloss. If you have a particularly large motorhome (or have a trailer, like us) you might need to park further away. 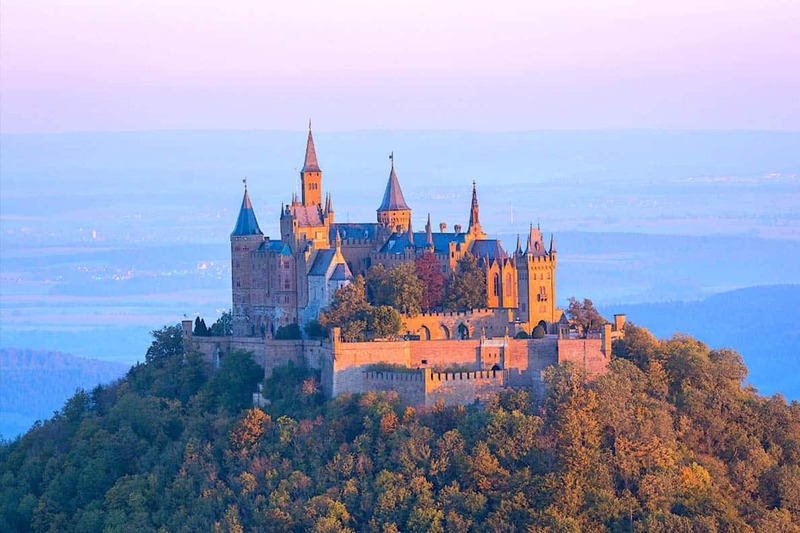 Hohenzollern Castle- fairytales don't get prettier than this!! TOURIST NUMBERS: Great in April- although the cafe was overflowing even in April. It will definitely get busier in summer. EASE of PARKING with RV: Easy, peasy, lemon squeezy. There's LOADS of parking and they love RV's- you can stay overnight for 4€ either before or after your visit. There aren't any facilities, but what a great place to park and you could be there dead early in the morning before the crowds and tour buses arrive. Opening hours: 10am-5.30pm, but please check in advance. Ticket price: 7€ for outside and catacombs, extra 5€ for the guided tour around inside. Shuttle bus up is 2€ one way or 3.30€ return. Why is it on the list of Best castles in Southern Germany? Lichtenstein Castle may be tiny, (much like the country Leichtenstein!) but what it lacks in size it certainly makes up for in sheer audacity. HOW does it manage to stay attached to that cliff? The mind boggles. It won't surprise you to know that you can't get inside without a tour. Tours are only in German, but English are given a leaflet to help. Honestly, this would be one when I'd probably skip the tour and just enjoy the outside- you get the best photos when the tour has gone inside and there is no-one left on the bridge! TOURIST NUMBERS: Not overwhelming, but can get busy in summer holidays. EASE of PARKING with RV: There's a large parking lot outside, which has motorhome parking. However, it was too small for us to park without going over several bays, which might be a problem at busy times. Opening hours: 9am-5.30pm, but please check in advance. Closed during winter. The official website can be found here. Ticket price: 2€ for outside and catacombs, extra 6€ for the guided tour around inside, which takes 30 minutes. Why is it on the list of Best castles in Southern Germany? We debated going to see this, but instead, we chose to go see the Rhine Falls- the largest waterfall in Europe. Still, looking at this picture I wonder if we made the right choice. (We did, we did- the falls were AMAZING!) Sigmaringen can be dated back to 1077. The castle sits on the banks of the River Danube on a rock called ‘Castle Rock'. TOURIST NUMBERS: Moderate. The castle is easily reached from Stuttgart so is a perfect trip out for anyone on a city break. EASE of PARKING with RV: As always with castles in built-up areas, parking can be tight. Follow signs for ‘Schloss' with caution. Ticket price: 11.50€ for guided tour and armoury visit. Neuschwanstein Castle- tragic, but oh so beautiful. WOW FACTOR: 5/5. Should I live here or at Hohenzollern?? It's a tough question. TOURIST NUMBERS: Crazy. Just crazy. Avoid summer if you possibly, possibly can. 6000 people/ day!!!! EASE of PARKING with RV: Loads of parking and RVs are well catered for. But signposts aren't great, so when the man says ‘Park in P4'…it's not easy to actually FIND P4. But it is there, up towards the castle entrance. Just follow the buses. Opening hours: 9am-6pm, in summer, but please check in advance. Ticket price: 13€ for tour. You can get up to the castle without a tour. There are buses and horse/ carriages up. Why is it on the list of Best castles in Southern Germany? I feel a bit sorry for Hohenschwangau. Anywhere else, that castle would be impressive in its own right- but when compared to Neuschwanstein it's like the dowdy, frumpy aunt who nobody really pays attention to. (See, you feel sorry for it now too, right?) So I've added it to the list. Besides, it's yellow- which is an awesome colour for a Castle. Respect. WOW FACTOR: 2.5/5. If you're tight on time, don't even worry about it. TOURIST NUMBERS: Crazy- but most of them are there to see Neuschwanstein so this one is slightly quieter. If you get a chance, check out the town of Fussen. It's a very pretty town with loads of quaint shops and restaurants. EASE of PARKING with RV: Loads of parking and RV's are well catered for. Someone will direct you. Opening hours: 8am-5.30pm, but please check in advance. Ticket price: Buy tickets for Hohenschwangau at the same place you buy tickets for Neuschwanstein. You can buy a combined ticket for both which is slightly cheaper, just be careful to leave yourself enough time between visits to get from one to the other! TOURIST NUMBERS: Lots of people like to see all of Ludwig's creations, so things do get a bit mad (ha- see what I did there….oooh, you're a tough crowd) in the summer. EASE of PARKING with RV: There's parking for 550 cars and 20 coaches. Motorhomes should be no trouble. Opening hours: 8.30am-5.30pm, but please check in advance. Ticket price: 8.50€ or 5€ just for the grounds. Why is it on the list of Best castles in Southern Germany? Really? Did you not see the photo above?? How beautiful a palace do you want??!! And continuing with our King Ludwig II theme- he was born here in 1864. No wonder he liked impressive buildings. You can tour around the interior, which looks jaw-droppingly beautiful. Click here for more pictures. WOW FACTOR: 5/5 I'm thinking I could have this as my summer home?? TOURIST NUMBERS: Busy in summer- avoid weekends if possible. EASE of PARKING with RV: There are ample parking spaces, and motorhomes are well catered for. Opening hours: 9am-6pm but please do check in advance. Ticket price: 11.50€ for combination ticket. Under 18s free. TOURIST NUMBERS: Pretty crazy in summer. Go off-season if you can. EASE of PARKING with RV: Aim for Prein au Chiemsee. From here, you need to park up and get on a boat. Loving this place already. The Eagles Nest. Not really a castle- but what a view!! Why is it on the list of Best castles in Southern Germany? Ok, ok- I'm kinda cheating with this one. It is not, and never has been, a castle or palace. But just LOOK at that location. Apparently, Hitler didn't visit here often, but Eva Braun entertained her friends here regularly. The road up to the ‘Nest' was blown out of the mountainside- literally!- and is so dangerous that it was closed to the public in 1952. Every Spring, the road is closed and cleared of fallen rock or loose debris on the mountain which might damage a vehicle. Access up to the top is now only by special bus service. Unbelievably it only took 13 months to build the entire complex!! WOW FACTOR: 6/5!!! New plan- I'm living here. TOURIST NUMBERS: Pretty busy in summer and tours should be booked in advance. EASE of PARKING with RV: Parking is at the bottom in proper car parks. Motorhomes should be no problem. Opening hours: MAY- OCTOBER only. Tours as part of a guided tour only. Ticket price: To do the morning tour, it's 30.50€ and can be booked here. There's also a restaurant- no reservation needed! Phew! That was a long post. Did you find it useful? Find something new to add to the Bucket List? Most of these places can be added to any sort of road trip, long weekend or city break, no matter how you're travelling. We had 2 weeks for our trip from the UK, and managed to get as far East as Neuschwanstein & climbed up Zugspitze. But we need to return so we can finish the list for ourselves. 3/4 weeks would be ample time to see them all- but remember these are only the ones in southern Germany!! Loads more to explore in the north another time. There are also plenty of fairytale towns in Europe for you to explore, as well as the 50 most beautiful castles in the world! Will the fun never end?!?! TELL ME- which of these castles and palaces have you visited? Which would you like to? Want to save this list for later? Here's the pin. Enjoyed this post? We'd love it if you shared it on Facebook, Twitter or Pinterest. Thank you! Such a great post! I saved it to Pinterest.. which I actually have a question on.. How did you get your pin to have the “Pin it” link and open up with the description and hashtags already in it? I love the way that works! I love this list! I had the opportunity to visit several of these castles on my trip to Germany last summer, and they were amazing. I loved how they were all so unique and had their own personalities. Thanks for the great share! You’re very welcome! Glad you enjoyed your trip- we loved it too. You’re welcome. They really are incredible places. These all look so incredible, and I imagine they’re fascinating to see in person! We have been to Linderhof and Neuschwanstein, but I’d love to return to Germany and explore more of these! We’re hoping to do some more later in the year. Hope this gave you some inspiration! OH MY GOODNESS I had NO idea there were this many incredible castles! I had heard of Neuschwanstein but I didn’t know there were this many equally incredible ones. Take me to Germany, stat!! Great post. Definitely made me want to go see these castles. I like how you added tourist numbers. What a great resource and comprehensive post! Love it! Just wow, wow and wow! I have a few Cinderella stories on my mind at the moment =D Awesome post, thanks for this! Great post, beautiful pictures! I had no idea there were so many picturesque castle in Germany! Love the interactive map! Thanks Demi- really pleased you enjoyed it! These are all so stunning! Schloss Sigmaringen really caught my eye. Although I’m glad you went to the waterfall, because I love waterfalls too lol. Yep- I’m a little obsessed with waterfalls. Something about them just fascinates me! I can help with where to park an RV in Heidelberg! If you do a map search for Uferstraße 78, along that stretch is where people tend to park RVs. It’s just a stretch of road, so it’s not a parking lot or anything, but I always see them down there (I live in Heidelberg). From there it’s a quick bike ride or bus ride into the Altstadt, and then you’re best bet is to take the funicular up to the castle. Plus side of parking in the spot I mentioned, there’s a lovely bakery/cafe across the little park, and you’re right next to the river. Glad you enjoyed our local castle, it’s a lovely one. I’ve been to most of the castles on your list now, but I think I need to go see Sigmaringen though! Wow! You guys did a really good job. I am ashamed. I am German and I haven´t even been to all those castles. Sometimes we travel that far but haven´t even seen the beautiful things and spots in our own country. Thanks for sharing. Great post these are all incredible castles! I haven’t managed to get to Germany yet but definitely will visit some if these one day! I hope you can visit one day- it was genuinely so much better than I expected. Omgoodness…I love Castles…We managed to see Cochem Castle and Helderberg Castle in 2016. It was pouring with rain when we visited Cochem and the path leading up to the Castle was very slippery. I am a Castle tragic so thanks for highlighting all the others that I have now put on the bucket list. Its growing. We just did Neuschwanstein Castle 3 weeks ago and we had such a beautiful day with the sun out. St Mary’s bridge scared me to death but I still walked acorss it just to get that perfect photo. Linderhof’s interiors were just gobsmacking and so decadent. Really was so beautiful. I can’t imagine living in a castle like that! I’ve been to Germany many times but never got a chance to explore these magnificent castles! I hope you get to change that one day Paulina!